Check out the full list of clinics for the location nearest you, and ask about special offers for new patients during Oral Health Month. After April, every clinic continues their support of community, dental education and oral health with other programs, promotions and specials. All of our practices are locally owned and operated by dentists in greater Vancouver, so you can expect to see your local clinic involved in everything from sporting events to educational funds, charities and performing arts. 123 Dentist clinics pride themselves on patient education, with the aim of avoiding the need for expensive procedures by employing preventative measures. In the long term, it benefits patients and dental offices to focus on preventative care, with an increased focus on hygiene. Many websites offer tutorials, procedure explanations and even videos to show patients what they can expect. 123 Dentist has a comprehensive database of dental procedures, how they work, and where they can be performed. You can even call our Emergency Dental Hotline! Ever had a toothache before bed and wanted to get some quick advice or schedule an appointment after hours? Only 123 Dentist provides patients a 24/7 resource with professional staff who can care for your dental needs, whatever they may be. Even if you cannot afford the dentist, call and ask for help or advice on preventing future problems or for help keeping the problem from getting worse. Many of our locations offer special promotions and discounts to employees in neighbouring businesses. If you work in a local mall for instance, there’s a good chance your local 123 Dentist office offers a deal for a full new patient exam. 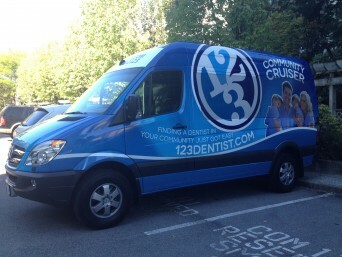 And there are 123 Dentist offices located in almost every major mall in the lower mainland. Many clinics offer promotions and will post flyers to local businesses, so if you’re searching for an offer near you, now’s the time to ask! Almost every 123 Dentist clinic has some promotion running at a given time. They range from online contests through Facebook, raffles in the office, and giveaways for patient referrals all the way to rewards for regular visits and coupons for new patients. Check out your local clinic’s website for a list of offers, and don’t forget to call and ask about new promotions. Prizes and gifts range from Starbucks or Tim Hortons gift cards to Cineplex movie tickets and Oral-B electric toothbrushes. You can often choose the gift you want to receive in a promotion, so if you already have a toothbrush, you may be able to opt for the free whitening for life instead! 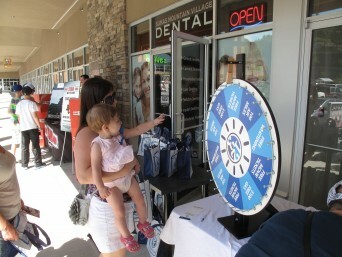 Promotions and raffles extend to children, too, with stuffed animals and toys raffled off at many of the family-focused clinics. We know that not everyone can afford dental care when they need it. That’s why we offer low cost care through our new clinic in White Rock, catering to families and individuals on a tight budget. Call our 123 Dental Emergency line for more information on clinic hours and wait times. For patients on a budget, many clinics offer low interest or no interest payment plans on a case by case basis. Student dental plans are accepted at a majority of clinics, and there are senior care discounts at many locations as well. Whatever your situation, 123 Dentist wants to make care accessible so you can put your family’s health first. At 123 Dentist, we pride ourselves on our ecological and environmental commitment. Almost all of our practices use modern technology like digital x-rays for a lower environmental impact. Materials are recycled and disposed of in an ethical manner, and many of our practices are now digital. By going paperless and connecting to the 123 Dentist network, not only are patient files transferrable for easy referrals, but there is no need to keep bulky paper records. Further results of energy efficient technology also include a greatly diminished carbon footprint. As 123 Dentist offices continue to become more and more modern, our commitment to the environment around us grows, too. Last year, we raised awareness for dental care with visits by the tooth fairy to many clinics across the lower mainland. The tooth fairy was on hand to dole out prizes and gifts to local patients, plus pose for a photo or two with the kids. Tooth fairy visits helped make dozens of children at clinics across the lower mainland more comfortable with dental care, and more aware of its importance. Several practices from Surrey to Coquitlam offer their own tooth fairy activities year round with educational sessions for children. All are aimed at making children more comfortable with the dentist to reduce the chances of them developing a phobia. Our clinics are well known for participation in fundraisers like Colour Me Rad, The Ride To Conquer Cancer, Christmas hamper programs, and so many more. Giving back to the community isn’t just about writing a check. Our clinics have teams running and cycling for charity, raising money in and outside the office, and spending their free time engaging with others. Clinics raise, match and donate funds to charity for a wide variety of issues, from cancer research and prevention to arts funding and animal care. 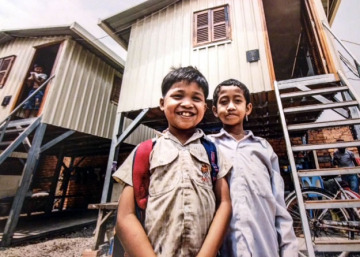 Some clinics travel off continent to build houses for the poor, while other teams donate their time to help the needy right here in Vancouver. From Langley to Pitt Meadows, from Richmond to North Vancouver, you can wave to your local 123 Dentist clinic as they participate in community events like parades and public holiday celebrations. Supporting the community begins and ends with engaging with people, so our clinics have booths or teams at a wide array of local events and fundraisers. Chances are good that if you see a dentist office participating in your community, it very likely is one of ours! Involvement in arts, sports, and community events provides additional funding and support for some of your favourite events, thanks in part to our clinics. That’s a lot of community involvement, and we didn’t even get into the specifics! For a full rundown of how your local 123 Dentist is involved in the community, talk to your dentist or a member of the dental team the next time you visit. Get involved in your community and tell us what cause is most dear to you. You never know, your local clinic might be willing to get involved – so reach out today!